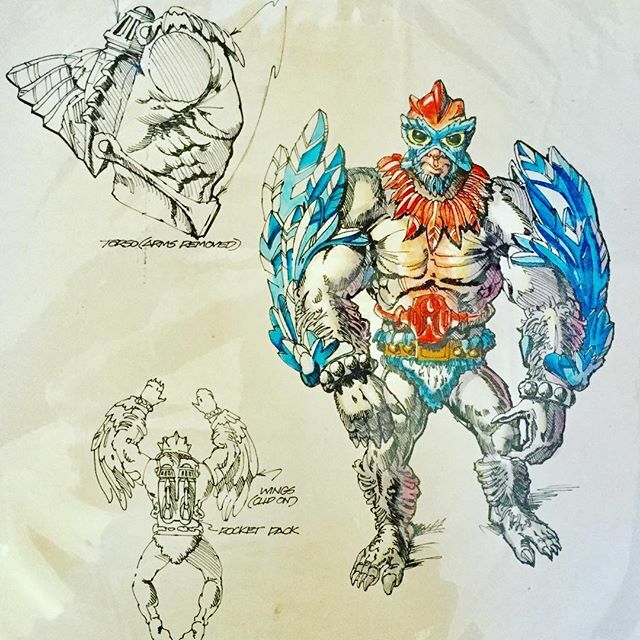 Stratos, designed by Mark Taylor, appears to have been originally conceived as a villain. 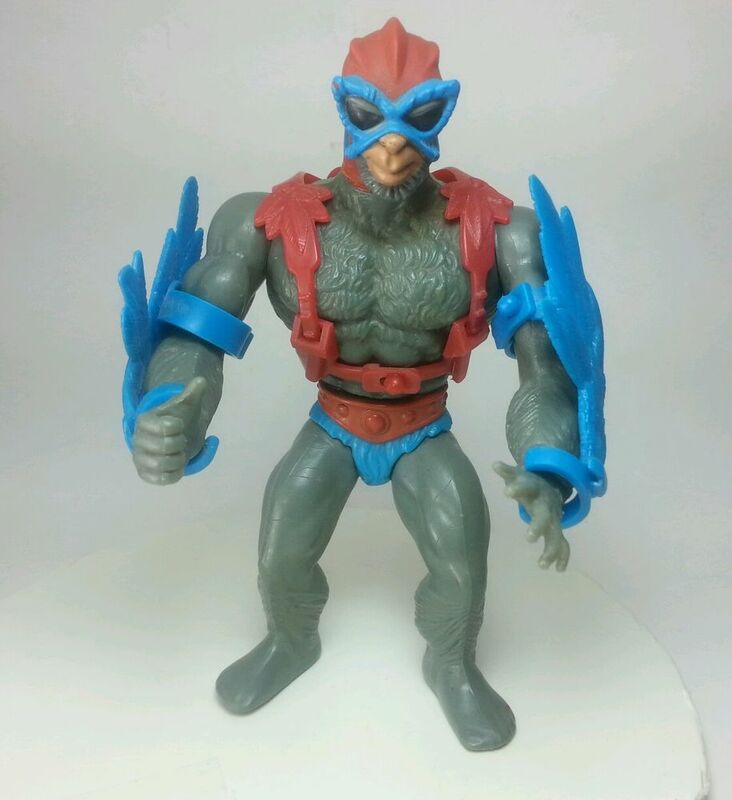 Given the working name “Bird Man” (also, perhaps “Wing Man”) Stratos was intended to have the hairy arms and legs of Beast Man, but the furless homo sapiens chest of He-Man. Artwork by Mark Taylor, showing the front, side and rear of the figure. Shared by Rebecca Salari Taylor. Stratos cross sell artwork. Image courtesy of Axel Giménez. 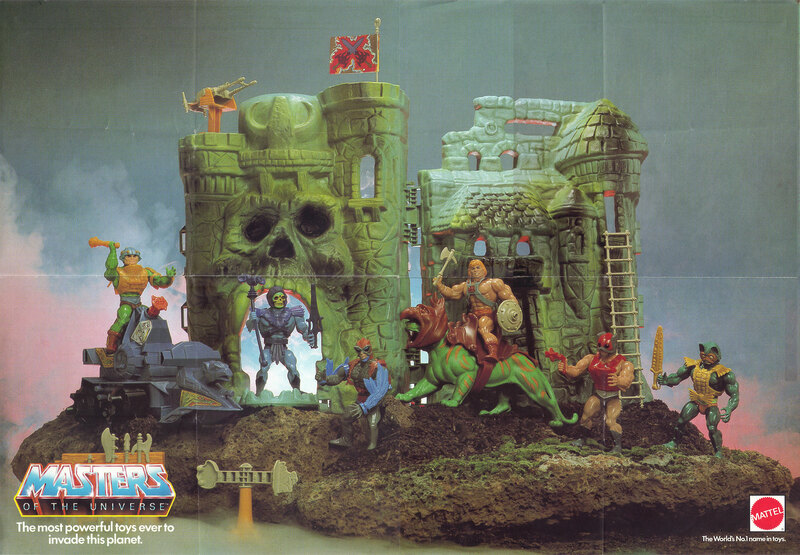 Image from: He-Man.org. 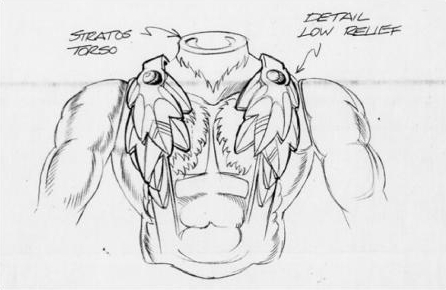 Note that the harness also lacks the feather design at the shoulders. There were some variations of early production versions of Stratos. 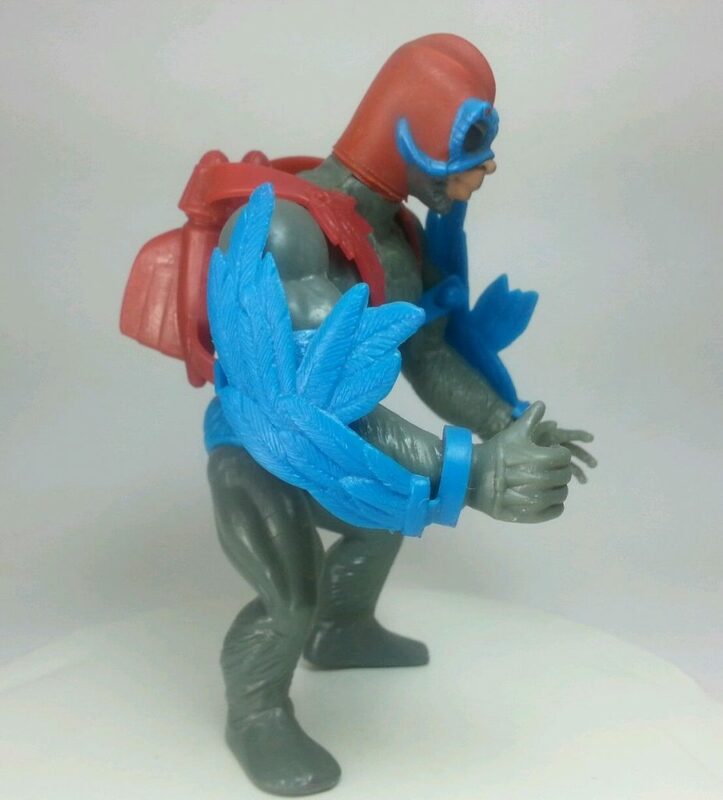 Some came with blue wings and a red backpack, and others with red wings and a blue backpack. 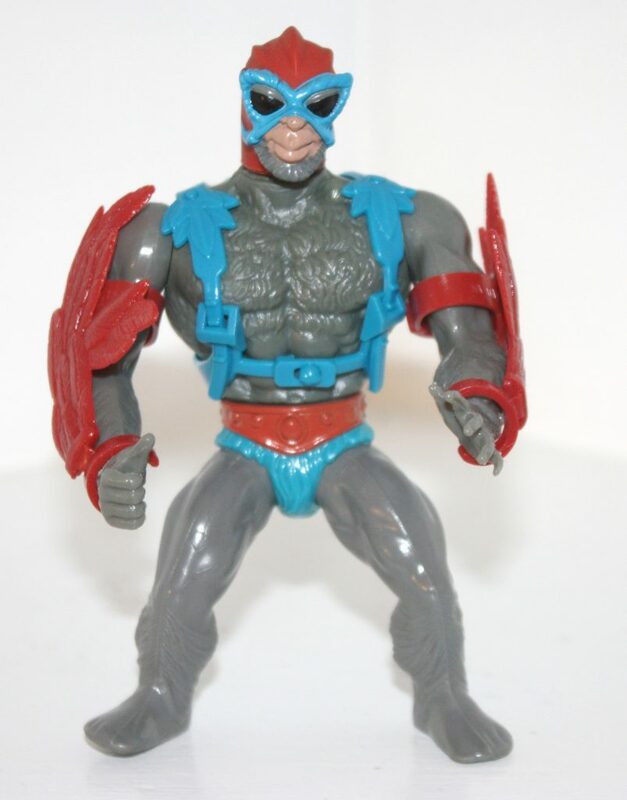 The rarest version had a blue beard and gray goggles. All mint on card examples of this variant that I have seen have blue wings, but loose examples have shown up with red wings. I’m not sure if those were original to the figure or if some part swapping occurred. 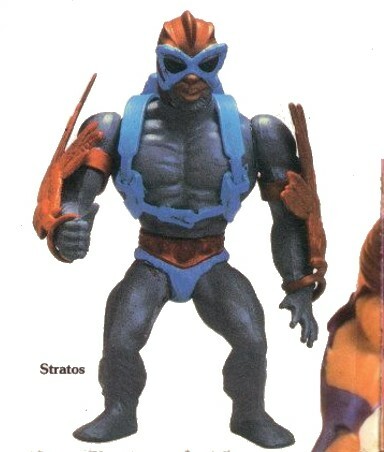 In any case, it’s possible that the blue beard version of Stratos is the very first version released, as it accords with Mark Taylor’s original color scheme. 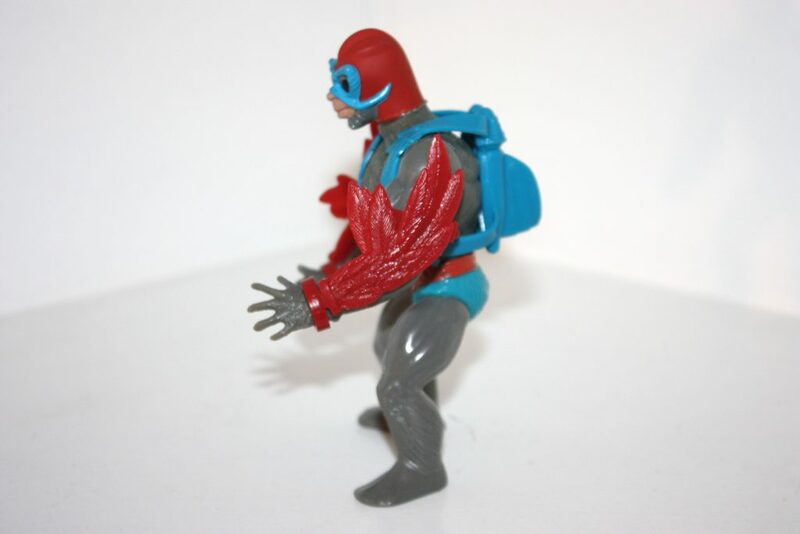 However, the earliest Stratos prototypes (as shown earlier in this post), had red wings and a blue backpack, so I remain a little uncertain on the issue. Most blue bearded examples seem to have blue “eyebrows” as well, but there was at least one example (in the first image below) with gray “eyebrows”. The first editions of Stratos was packaged on the “eight back” style card. 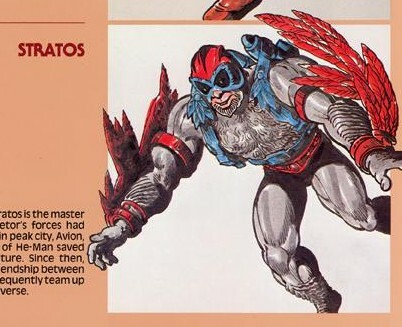 Stratos seemed to appear frequently in books and comic books in the first few years of the line, but his appearances became rarer afterwards. 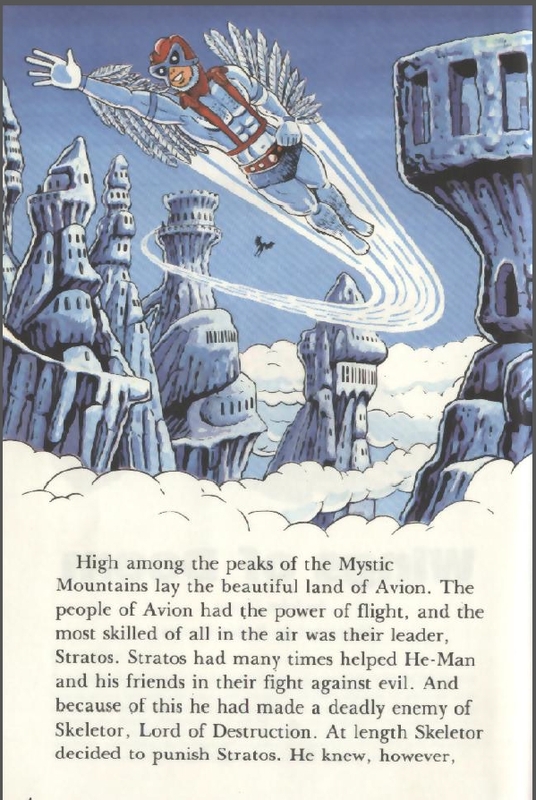 Stratos made occasional appearances in the Filmation cartoon. He wasn’t depicted as a flying ape-like creature. He looks instead like a human in a kind of flight suit. 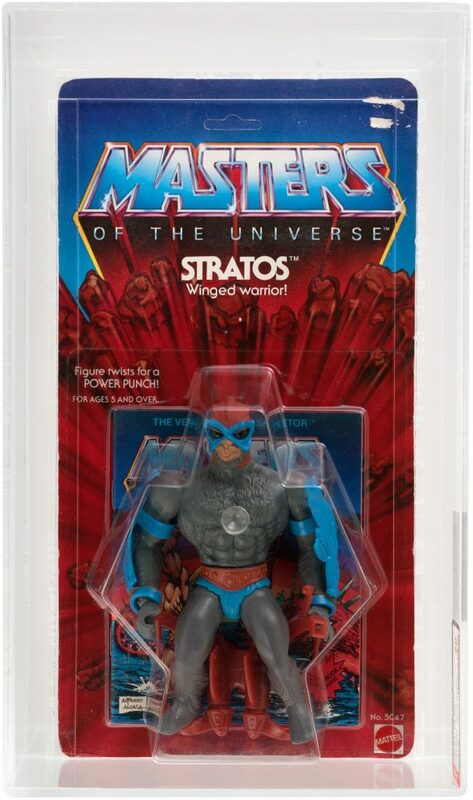 Stratos probably isn’t near the top of most people’s favorite MOTU character lists (although some people absolutely love him). As a kid he didn’t particularly spark my interest, but as an adult I find him enormously charming. Ahh, Stratos. A strange ol’ character. 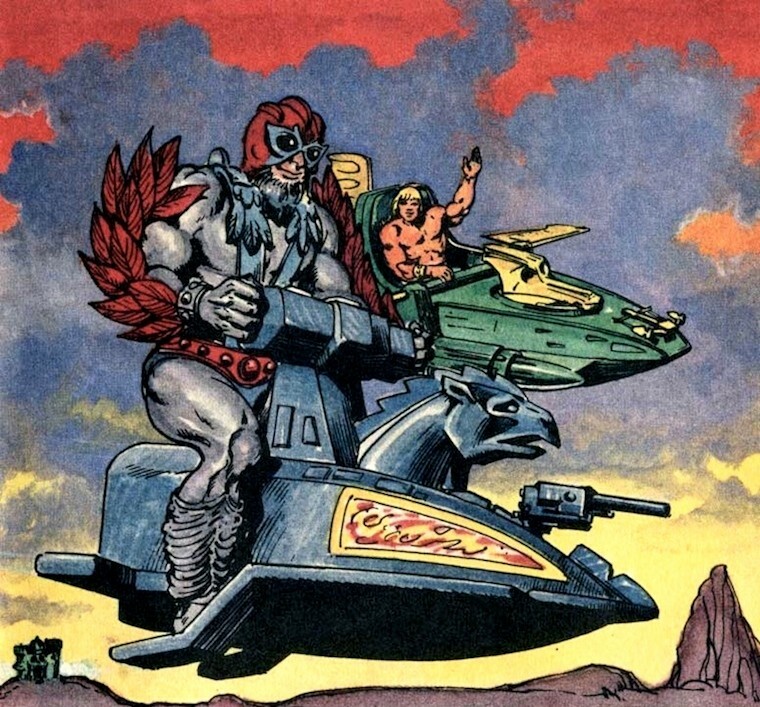 As one of the resident “early barbarian mythos” fans, I should like Stratos. And part of me does. But, when you break him down, particularly as a figure… he’s actually kinda boring! 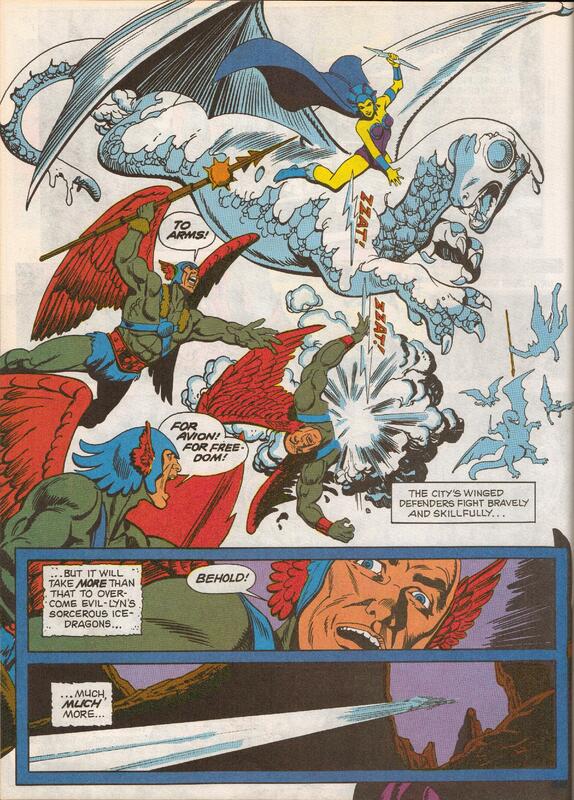 Don’t get me wrong, the concept is great – and perfectly logical for the early origins of the line; a flying, winged warrior. But for whatever reason, during execution, he just seems to have become slightly uninteresting, especially on hindsight. 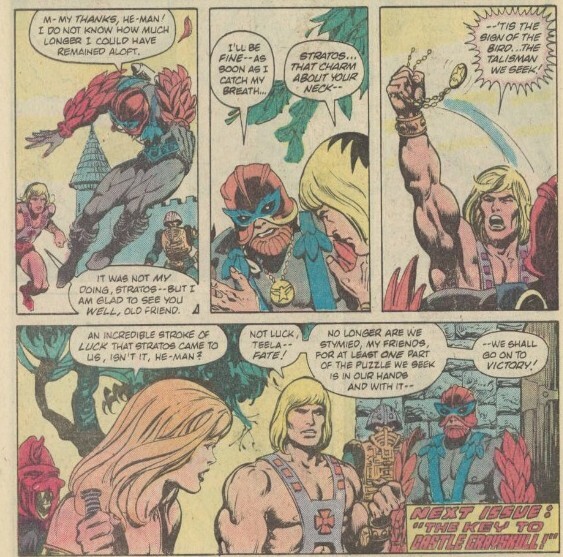 The heroic/evil designating of Stratos was interesting too, and not uncommon (at one point, Mer Man might have been a heroic warrior, and Tri-Klops too), however it’s interesting to see just how late his siding seems to have been decided on – even the first couple of mini-comics depict him as an evil warrior. 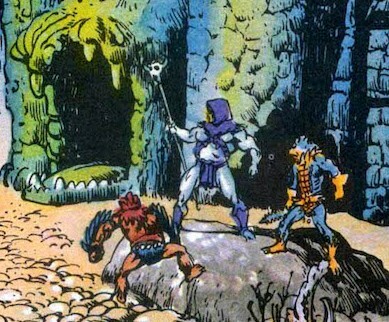 These early evil references even followed through to some later merchandise, with some items stating him as an evil warrior appearing as late as 1984. 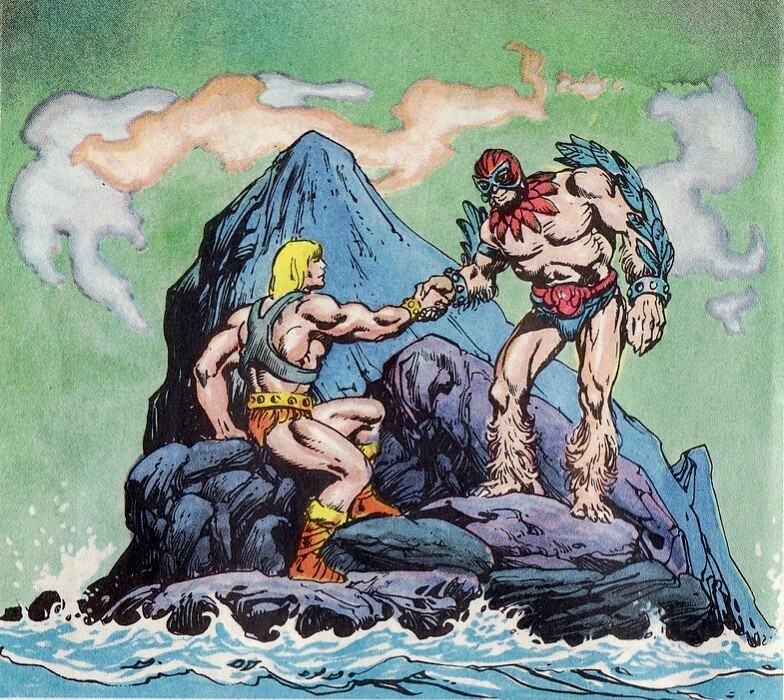 In my own MOTU world, Stratos was a once noble birdman who had been turned bitter and evil as a result of the Great Wars which wiped out most of Eternia (reflected in his skin colour change) who was eventually convinced by the barbarian He-Man that there was hope in saving Eternia, and returned to his rightful place as leader of the bird people. 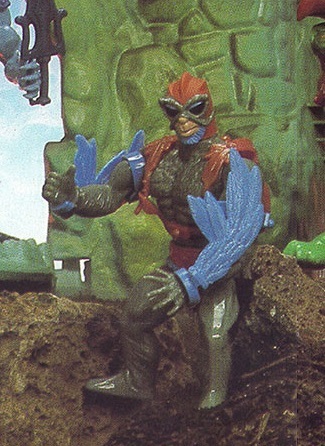 As for the ‘which came first’ colour combination of wings/jetpack… I never have fully deduced. 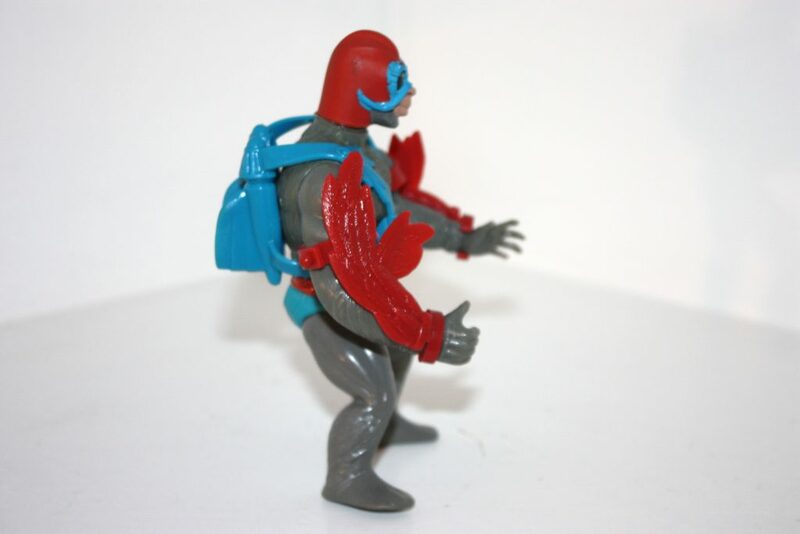 For many years I believed the red wings / blue jetpack to be the original; but then it seemed it to be the opposite. Maybe there actually never was a distinct version and there always was two versions? 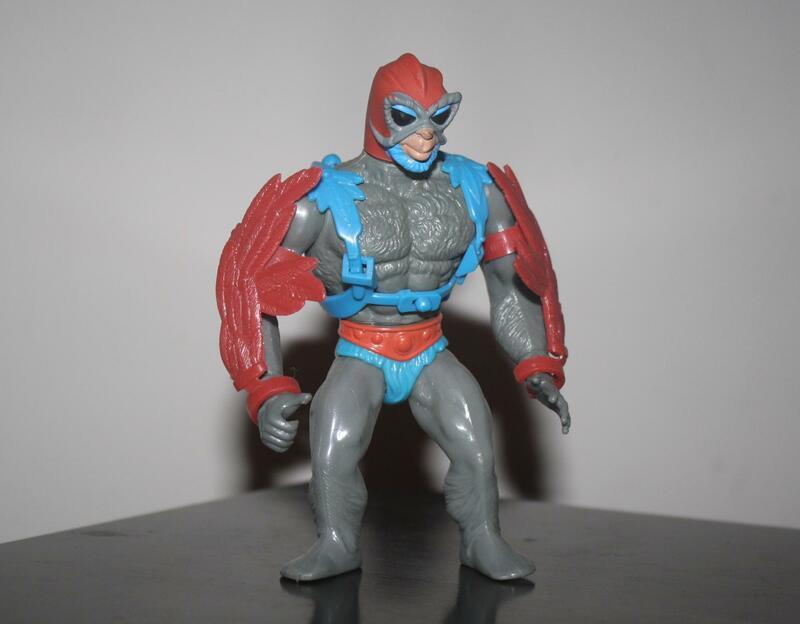 The day I brought my childhood Stratos figure, the pin that held the wing on his left arm snapped off as my dad assembled it with me, meaning that the wing hand to awkwardly be held on my an elastic band forever more. Also over time, as with many other examples of the figure, over time the paint on the nose of my Stratos wore away, leaving him with a red alcoholic looking nose! 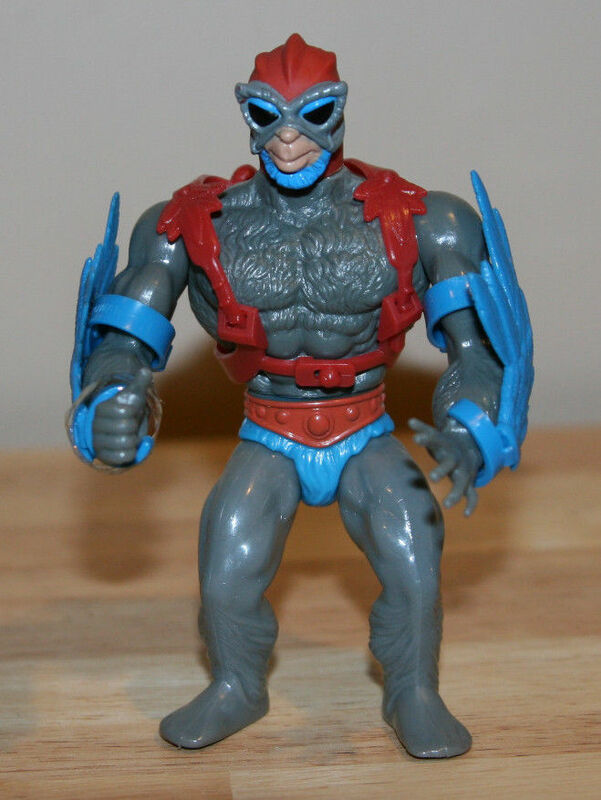 Stratosphere was one of the first figures that I got as a child and I always had a soft spot in my heart for him. 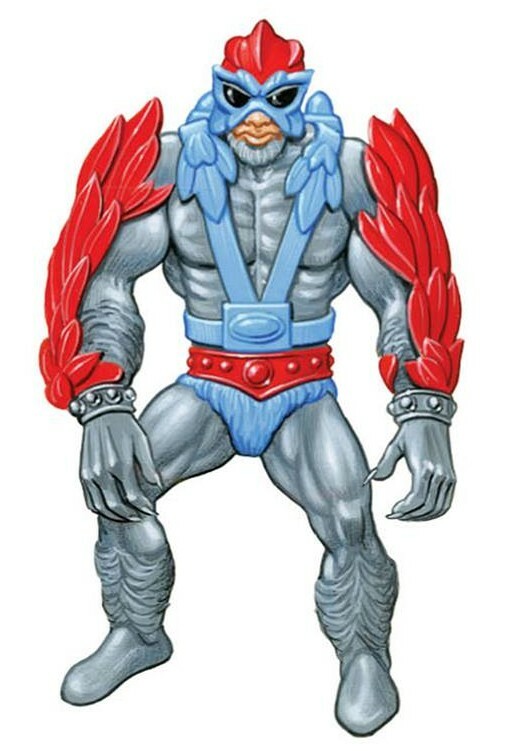 He didn’t have a cool weapon or much of a backstop (at least not with the original mini comics, which were my first introduction to the world of Masters of the Universe and served as the primary blueprint for the head canon of my youth). 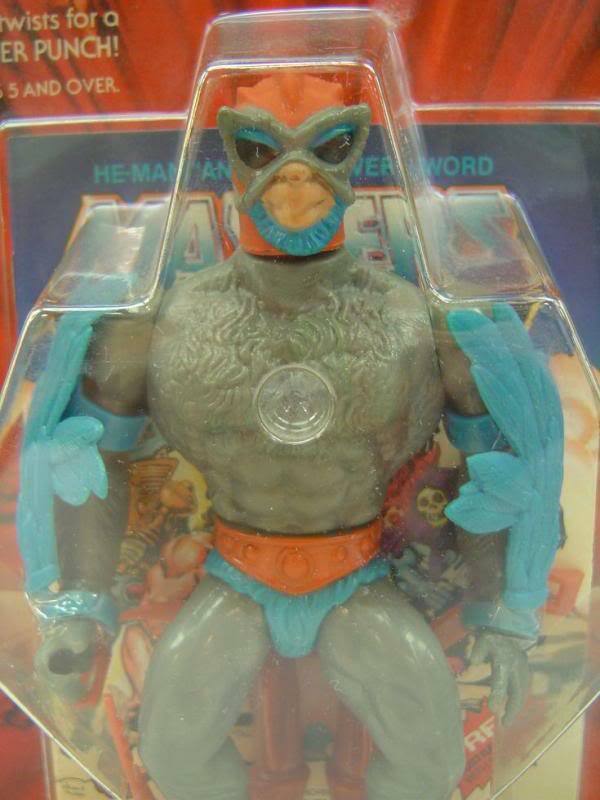 He just had his oddly charming design, looking like a monkey man with a jet pack, helmet, and feathered sleeves that were his “wings”. 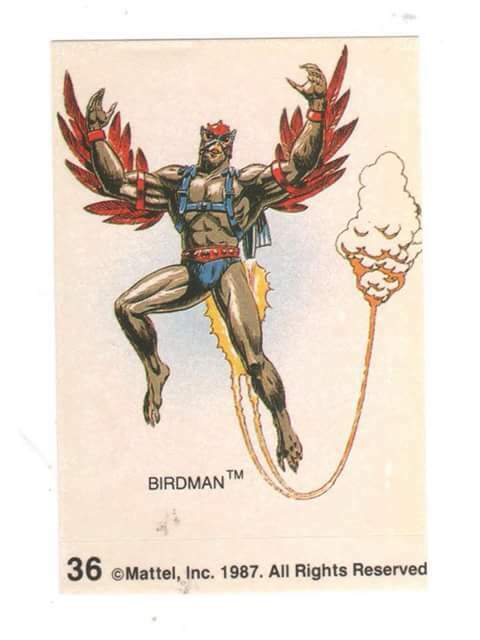 I ran with that and made him a slightly unhinged ape man that found a trove of Ancient devices that included his helmet, jet pack, and “wrist blasters” that were portrayed in one of the mini comics and thought that the made him a “bird man”. 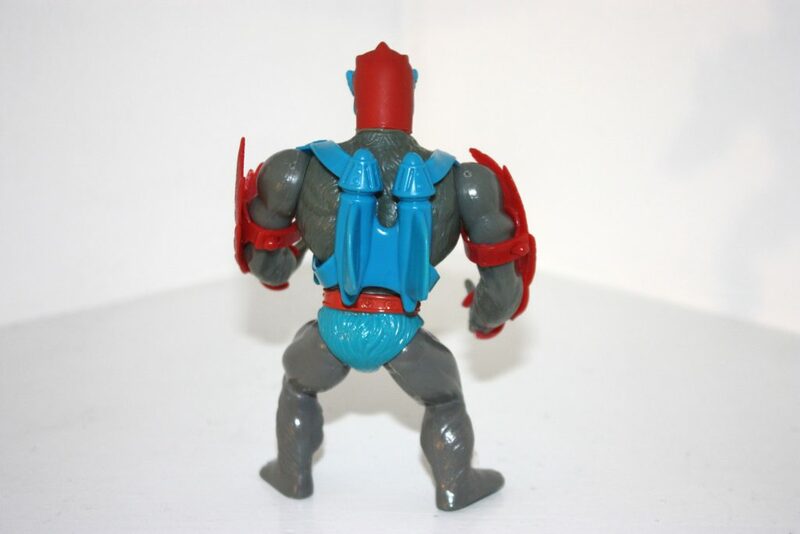 He was so plain that I thought I had to give him a cool back story as a kid. 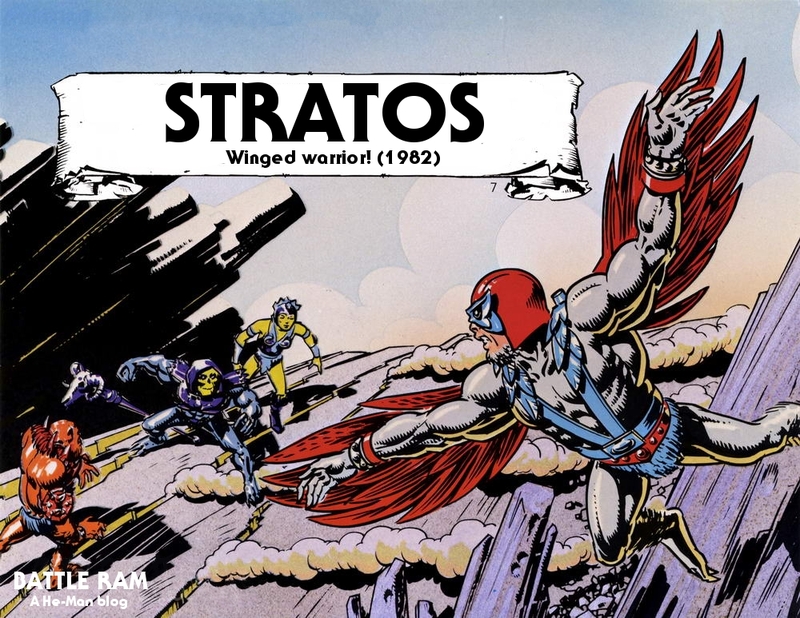 I wonder if any prototypes will ever show up of Stratos wearing armor more resembling his b-sheet designs, with the plumes of feathers around his neck, or indeed the higher ‘feathered’ armor around his neck of the boxart. I’d guess that there was at least a prototype vaguely resembling one of these at one point; especially that of the boxart look (which nearly always took their cue from early prototypes). I know I’ve commented before but Stratos’ armor is one of the things that really let the figure down IMO. 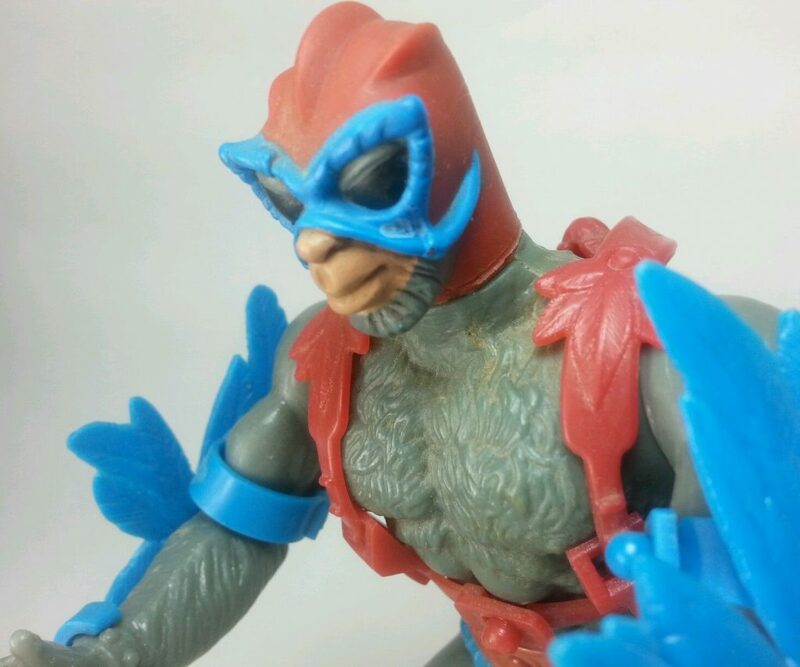 It just looks like he’s got it on backwards (with the strap harness on the front), and rather bland at that, with none of the feathery embellishments around the neck. Add to that the drab grey colour (not the silvery-grey of the boxart) and lack of any weapon, and the vintage Stratos figure went from a could-be-classic to a like-him-but-only-in-concept entry. Which was a serious shame. When I was a kid back in the 80s, in those pre-internet days my Mum would buy from home-shopping catalogues. Of course, my brothers and I (infants, all!) 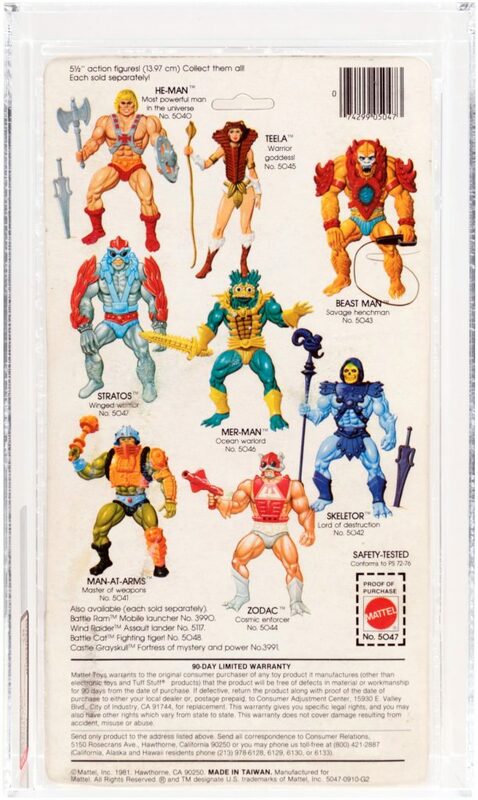 would always flip to the toy pages first. 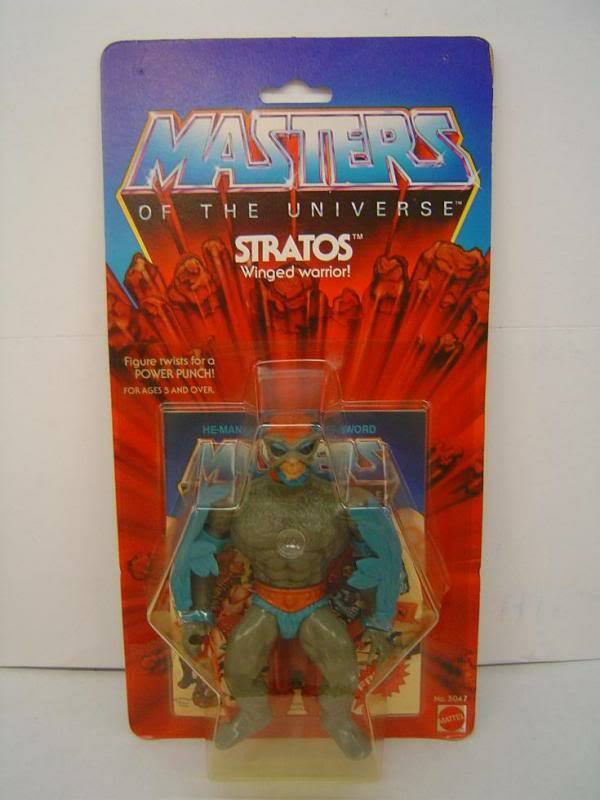 There was one catalogue in particular that I reeeeeally wish I’d kept; it included a photograph of the Masters figures available from the catalogue, a photo which featured Stratos…, but in this particular picture, he was a brown / tan colour! I rushed to show my brothers and we were amazed, but we were only ever able to find the grey one for sale anywhere. I wish I’d kept the catalogue as proof. Looking back on it, I can only think of two explanations; a prototype figure, perhaps based on his earliest B-sheet and mini-comic appearences, found its way into the toys being photographed for home-shopping catalogues, (indeed, in recent years Super7 have produced Stratos figures in precisely this tan colour-scheme), or some chemical discoloration in the photo or the page turned a grey Stratos brown… yet somehow the other Masters were not affected. The second explanation seems less likely as only Stratos was altered! My guess is that the first explanation is the correct one, but without that book I have no proof. Thanks to Super7, I at last have a brown / tan Stratos… but I sure wish I’d kept that catalogue. Very interesting! Do you happen to remember what company put out the catalog? It’s difficult to say which catalogue it was because my Mum and my Nan had so many of them! However, the catalogues they used the most were Grattan, Freeman’s, Littlewoods, and J.D. Williams, (these are all English companies, by the way). Each of those companies published two catalogues a year, and you’d have to check from around 1982 all the way to 1989, I guess. Even so, in the end it might not have been a catalogue from those companies at all; Mum and Nan might have picked up a book by someone else along the way. It would indeed be quite a task…, although I’d have to concede not an impossible one. I wish I’d kept that book! It would have prevented such a headache! These companies would publish two catalogues a year, and you’d have to check every one of them from 1982 to ’89, I’d guess. Even so, in the end it might not have been a catalogue from those companies at all; Mum and Nan might have picked up a book by someone else along the way. It would indeed be quite a task…, although I’d have to concede not an impossible one.